When someone asks me to choose my favorite Maine birding memory, an August afternoon in the North Woods immediately springs to mind. I am paddling, surrounded by a mixed softwood forest of red spruce, American beech, maple, and birch trees, a clear pond beneath my green, Old Town canoe. Golden reeds sway gently in the summer breeze, while the puffy clouds of a recent storm skirt across the blue sky. The air is alive with noise: chirping frogs, bird calls, and the gentle splash of my husband’s and my paddles hitting the surface. Suddenly, the afternoon echoes with the eerie calls of the Common Loon. Slowly approaching a pair of the ancient birds, I raise binoculars, holding my breath. There it is, the fuzzy form of a loon chick, bobbing on the gentle waves between parents. The three swim slowly, allowing the webbed feet of the little one to keep up with the adults’ stronger strokes. Have you ever heard the squeaks of a loon chick? They sound like little kittens, melting the heart of the most stoic of observers. While the family floated away from us, my smile stretched from ear to ear. As a recipient of a National Geo­graphic Young Explorers Grant, over four seasons I visited the headwaters of five of the major rivers of Maine, birding as I went. One was the East Branch of the Penobscot River, a 75-mile-long tributary of the second longest river system in the state. The East Branch runs alongside and through portions of the Katahdin Woods and Waters National Monument, which President Obama designated in August 2016. I spent three days exploring the natural area nearly a year before the ink was dry on the proclamation. I sincerely hope that many more visitors will have the opportunity to experience amazing moments with birds of the state’s North Woods, like my sighting of the loon family. A recent “review” by the Trump administration, however, put the future of Katahdin Woods and Waters and 26 other national monuments in doubt. In August 2017, the interior secretary said he wouldn’t recommend eliminating the monuments, but changes to the management of Katahdin Woods and Waters may be coming. At approximately 87,500 acres, the new national monument protects a significant area within the 3.5 million acres of the North Woods, most of which is owned by private timber companies (that allow access for a fee). Historically, logs were floated down the long rivers until they reached mills, guided by loggers and woodsmen. Railroads reached the area but were later abandoned, and sections of the forest shroud rusted tracks and locomotives. The North Woods is accessible by boat or along dirt logging roads and is visited by 100,000 people each year; however, the roads can be rough, and many are blocked by gates. 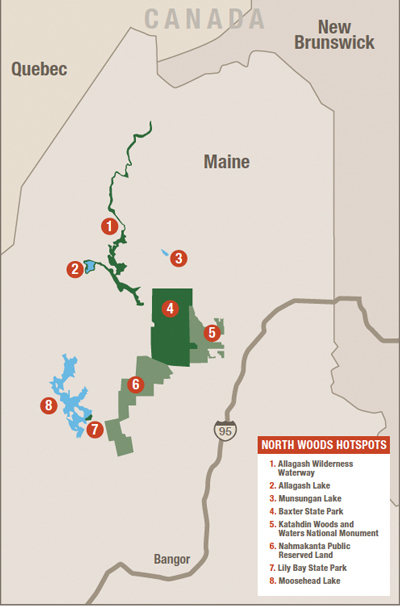 As a result, the Katahdin Woods and Waters area, with its hiking, hunting, biking, fishing, snowmobiling, and cross-country skiing opportunities, represents a significant improvement in access for the public, including birders. While easy access is always a bonus, birders should put the new national monument at the top of their travel list for one simple reason: its community of species. As I followed the East Branch of the Penobscot from its headwaters down into the national monument itself, I spotted Gray Jays and Spruce Grouse — beautiful boreal species at the southern end of their range. As I walked along an overgrown road, which provided a trail bordering the banks, neotropical migrants like Black-throated Green and Yellow-rumped Warblers and Blue-headed Vireos called from the canopy above me, at home in the foliage of white birch and sugar maples. Simultaneously, I never tired of the Red-breasted Nuthatches and Black-capped Chickadees that are common throughout the state. 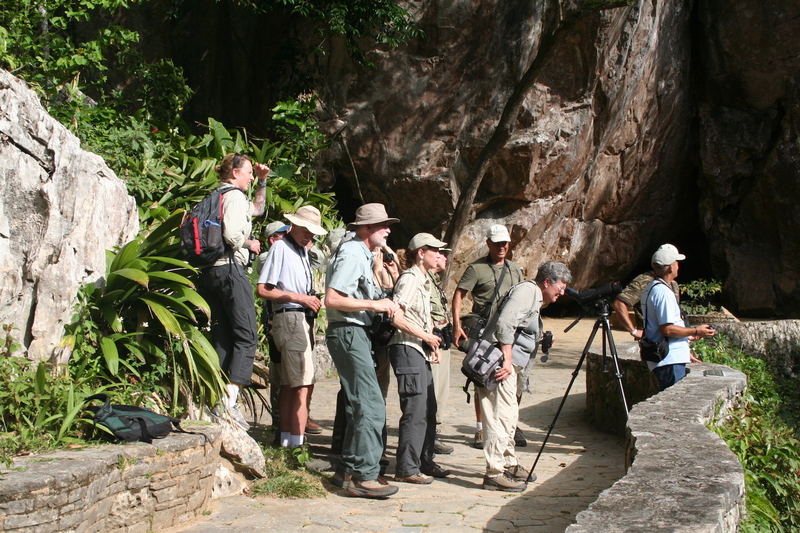 Birders can see all these species and many more within the park. 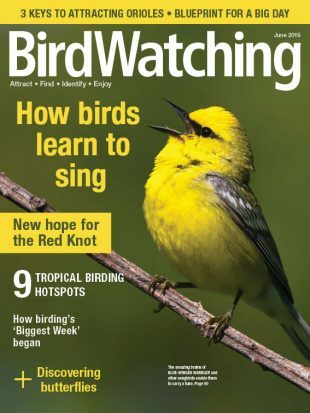 Doug Hitchcox, staff naturalist for Maine Audubon, notes that migrant warblers that pass through the southern part of the state breed in abundance in the North Woods. 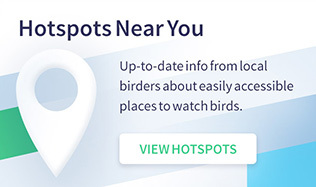 Allison Wells, senior director at the Natural Resources Council of Maine and co-author with husband Jeff of the book Maine’s Favorite Birds, underscores the importance of nesting area for birds and birders alike. “The new national monument is an exciting victory for people and wildlife, including birds,” she says. 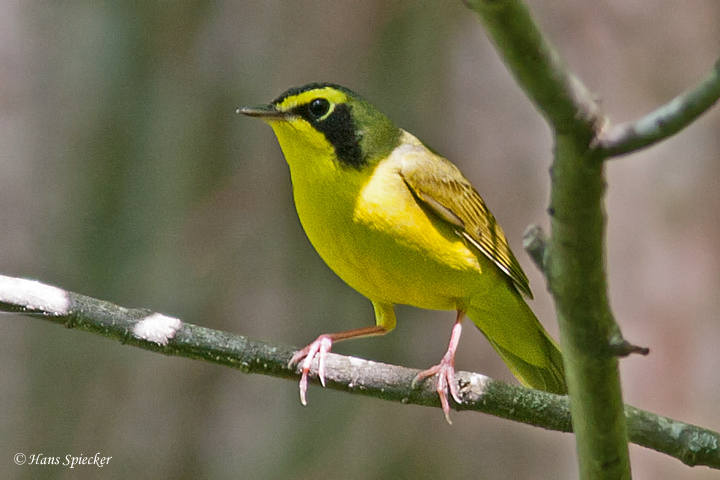 “These protected lands will provide nesting and migratory habitat for hundreds of thousands of birds including many that are of high conservation concern — Rusty Blackbird, Canada Warbler, and Olive-sided Flycatcher,” Wells adds. The monument is also important for iconic species such as Common Loon and Bald Eagle and birds of the boreal forest, such as Spruce Grouse, Boreal Chickadee, Gray Jay, and Black-backed Woodpecker. The national monument is adjacent to Baxter State Park, itself covering more than 200,000 acres. Together, the monument and park provide a large tract of land where forests can mature. The protection will “certainly help us to have more diversity in the forest,” Hitchcox says, referring to the young and managed forests logged in much of the privately owned sections of the North Woods. 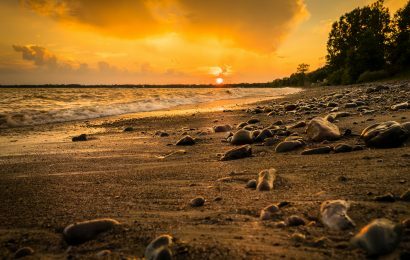 Katahdin Woods and Waters and Baxter State Park, however, are not the only areas within the North Woods to explore. I also visited a few other hotspots in the region. The Allagash Wilderness Waterway allows visitors to experience the forest without the obvious trappings of humanity. The 92-mile-long waterway protects ponds, lakes, streams, and much of the Allagash River from the town of Allagash, which is just south of the Canada border, to the southern end of Telos Lake, which is near the western edge of Baxter. My husband and I put in our canoe above Allagash Lake in late August, alternatively lining the canoe in low water and paddling where the stream deepened. Barely five minutes into our paddle, we spooked a moose, watching as it galloped through the undergrowth like a fur-covered bulldozer. The birds were easy to spot. An Osprey soared above, a dozen Spotted Sandpipers dipped their tails and peeped as they flew from one bank to another. Within the canopy, chickadees and nuthatches sounded their nasally calls. No planes can land on Allagash Lake, and access without a boat is difficult to say the least. We could still hear the dim rumblings of logging trucks, but the shores of the lake remained natural, white birch bark contrasting with the dark forest behind their trunks. Though they are difficult to see across the water, the area includes campsites, which we definitely appreciated when we spent the night next to Allagash Falls. Though McPhee visited in the 1970s and I made my voyage in 2016, word for word his experience matched my own. 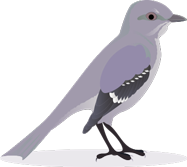 For birders, the Allagash Wilderness Waterway offers the chance to see riparian-dependent species as well as forest residents and migrants, from Common Loon to shorebirds to Black Tern, Belted Kingfisher, Gray Jay, vireos, and warblers. Paddling opportunities are not limited to the waterway; neither are the camping resources. The region is dotted with lakes, ponds, and accompanying access points. Because I was interested in river headwaters, I chose Munsungan Lake, headwaters to the Aroostook River, for one of our final excursions. We carried the canoe down a rough dirt road, putting in near a lakeshore campsite. Here we paddled past more loons, Red-breasted Mergansers, and a chuckling kingfisher. As we moved across the widest section of lake, a Common Raven’s croaks reached us across the water. Moosehead Lake, headwaters of the Kennebec River, and adjacent Greenville provide an excellent home base for winter birding. I explored the lake only one day after a huge blizzard blew through, coating the ground with more than a foot of bright white powder. The temperature had dropped below 10°F, with a brisk wind chilling me even further. My mother and I, decked out in as much winter gear as we could manage, opted to snowshoe Lily Bay State Park, which lies on the lake’s eastern shore. The path through the woods was easy to follow, and we dodged falling snow as it slipped from the hemlock boughs above. Kinglets and Boreal Chickadees sang from the bare branches, and we watched a Hairy Woodpecker, undaunted by the temperature, peck away at a dead snag. As we moved, the snow fell so hard that I could hear it, like the gentlest of rain hitting soft ground. Looking out across the lake, the curtain of white obscured the near shore, and it was easy to imagine us all alone in the North Woods. Moosehead Lake boat launches are great places to look for wintering waterfowl, and when the ice closes in, many visitors cross-country ski around the edges. Though we chose to snowshoe at Lily Bay, entire trail systems for snowshoers and skiers alike are groomed at the Birches Resort and throughout the area. Much of the North Woods is a working forest, and one cannot overlook the local, human resources. One of the best aspects of my expeditions was the opportunity to stay in various sporting camps and speak with those have lived here for decades, if not generations. At Pittston Farms, I listened to Wilson’s Snipes and Great Horned Owls calling across Seboomook Lake. Bob Johnson from Johnson’s Allagash Lodge gave me advice for paddling the headwaters of the Allagash and Aroostook rivers, and Joe Christianson from Matagamon Wilderness Campground led us miles down dirt roads, across a beaver bog, and to a canoe launch on Third Lake, part of the East Penobscot River system. They not only helped me navigate around the North Woods but also instilled a richer sense of the region as a whole. The Katahdin Woods and Waters National Monument is an ideal place for birders to explore. 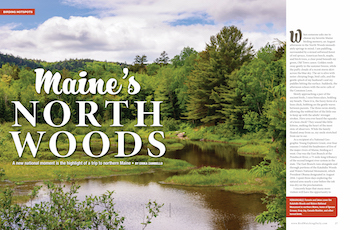 Plus, Maine’s North Woods offers so much more. Paddle the Allagash Wilderness Waterway, hike Mount Kineo near Moosehead Lake, camp on the shores of Munsungan Lake, or spend a few nights at one of the area’s sporting camps. I guarantee you won’t be disappointed. Erika Zambello is a National Geographic Young Explorer grant recipient and the cofounder of the communications company TerraCommunications.org. She has written for Florida State Parks, National Geographic Adventure, and other outlets. For BirdWatching, she also wrote about Black Skimmers and Least Terns in the Florida Panhandle.